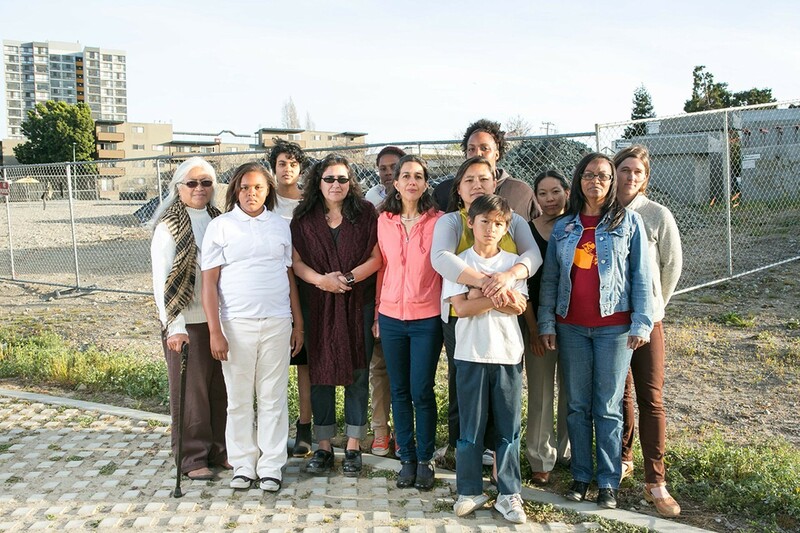 Members of Eastlake United for Justice, a neighborhood group advocating that affordable housing be built on city-owned land, stand near the 12th Street Remainder Parcel. The city of Oakland is finally coming into compliance with the California Surplus Land Act. On Tuesday, Oakland quietly issued a “notice of intent and offer to convey property” for the 12th Street Remainder Parcel, the acre of land near Lake Merritt that until recently was slated to become a 300-unit luxury apartment tower. Under the Surplus Land Act, Oakland was required to first offer the site to affordable housing developers, but the city instead issued a private RFP to three companies seeking to build luxury housing on the site. “The council has stepped up to do the right thing and we’ll be watching to make sure that they comply fully with the law this time around,” said David Zisser, staff attorney with Public Advocates, about the city's decision. The new notice was issued to government agencies and affordable housing developers. It gives them sixty days to notify the city if they have any interest in purchasing the land. If any agency or affordable housing developer expresses interest in the property, Oakland is required to negotiate with them for ninety days. At least one affordable housing developer, the East Bay Asian Local Development Corporation, previously expressed interest in the 12th Street Parcel. Oakland does not appear to be advertising the notice, however. The parcel isn't listed on Oakland's real estate website alongside other city-owned properties that are for sale. For months neighborhood activists opposed sale of the city-owned property to the developer UrbanCore, claiming that construction of market rate housing on the site would worsen the area’s affordability crisis. In numerous planning commission and city council meetings, residents of the neighborhood and affordable housing advocates asked that the land be reconsidered for affordable housing development, and that a new RFP be issued. Instead the Oakland city council pushed ahead with their plan to sell the land to UrbanCore for $5.1 million. Only when the City Attorney’s confidential legal memo stating that the planned sale was illegal under the Surplus Land Act was made public did the council change course.